Even though he didn't make the top 10 East Coast Rappers list, doesn't meant that 50 Cent isn't a top tier New York artist! It's time he get some love on this site! This song needs to be here. I'm sure people will find arguments for better songs out there but this song put 50 on the map! Even though the song was in jest, it did reveal 50's penchant for getting into beef and really going there with his adversaries. Thanks to much goading, Pauline and I have fallen for Power's charms. This song acts as the show's theme song so I can't hear it and not think of some pretty great times. You can check out the music video for this song HERE and think about how fun next season will be! This is definitely an instance of 50 letting the beat do the heavy lifting. I can't say I only like the song because of the beat, it's more that 50 knew exactly how to harness the energy the beat so that everything came together to for the song to be greater than the sum of its parts. HERE's the video for a song I don't think showed up on any official album. You gotta love 50 for that. You gotta respect 50 for getting a Kendrick feature before he truly blew up. Some could say that they had a friend in common in Dr. Dre, but I still choose to believe that 50 just recognized the true talent of King Kunta! Check out yet another video for a song that isn't on any official album HERE. This video made me like the song even more. 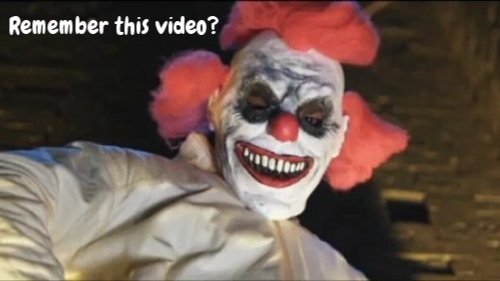 I can't be certain if the clown stuff is inspired by The Dark Knight but I choose to think it is. It's also a pretty out there concept for a 50 Cent video. I'm sure his reps made him shoot party footage to cut back to so no one thinks he's actually crazy. I would have loved to stay with the clown heist though. This is the song that starts off the Ryan starring film, Get Rich or Die Tryin' and it must be respected as such! The menacing horns and drums are the perfect backdrop for 50 and Young Buck to make sure you know that they are menace to society... and you in particular, BOY! A slept on beef, if you ask me! 50 Cent versus Cam'Ron had some great moments! I don't know if the video for this song, found HERE, is one of those great moments. But this song was definitely able to stand up to "Curtis" even if the follow up antics and songs weren't able to. I mean, there's no chance this list could happen without 50s crossover hit! People will still reference this song. I was never truly a big fan of this song but it is undeniable the legs this song had. Everybody at some point nodded their head to this song. Relive the meta moment Eminem and Dr. Dre were shown rebuilding a shot 9 times 50 Cent in a lab HERE. I guess I didn't want to like 50 Cent because I thought he and JAY-Z had beef but this song made it impossible for me to keep resisting the genius that is 50 Cent! The song doesn't just sound good it introduced a new word to my vocabulary! Anyway check out the amazing video HERE! I guess history has cemented the narrative that this song didn't work for 50 Cent when he tried to use it as a lead single for his album that would name itself after Cam's diss song. I remember thinking this was a great use of Tony Yayo and a dope song overall. Check out the video HERE. Not for nothing, but the edits on these songs really don't leave much of 50's original lyrics do they? Some hungry 50 for the list! Mixtape 50 is arguably the prime 50 in terms of work ethic and ability to connect with an audience. This is pre Shady/Aftermath 50 Cent and off an album that was never released due to his getting shot 9 times. Probably a vibe his previous record label couldn't get behind. I don't care if you don't like this song! The original is dope and it's a remix that features two mega stars... it's right up my alley. The fact that 50 continues to throw minor and major jabs at the two men on this song is interesting to me. But, the day it was announced they'd all get on the song and it wouldn't be some DJ edit, I was excited. The remix delivered for the most part. Although, if I were 50, I would have put this on the actual album knowing I was going up against Kanye. Also yes that picture really happened. 50 ran out while Jay-Z, Diddy, and Ye were performing... hence his lack of microphone. Back to mixtape 50! I'm here for it! On an almost equally important note, this song also reminds me of the DJs having albums era. This track is off the DJ Kay Slay Streetsweeper album. Check out this tracklist, BRUH! Although this was used on the soundtrack to the aforementioned Ryan vehicle. This song hit the net with a different hook. A hook that featured the names of the window shoppers in question. Ja Rule, Jadakiss, and Fat Joe. That's the 50 you have to root for. The guy who actually said names and didn't have any qualms using his commercially viable, Bob Marley sampled, single to diss his foes! Am I only one who forgot that Ma$e co-stars in the video for this song? Watch it HERE for a refresher. 50 Cent over sample centric music will always work for me. The aggression of the beat and 50s delivery is definitely something special on this song. I hope this list proves that 50 isn't dependent on Dr. Dre production, but you can't deny he sounds great over it. The two made some real bangers together! "If I Can't" being one such example. 50 knows how to write a hook and with this Dre beat backing it, this is one of my favourites of the album and overall. Even Jay had to get on this beat! #9- "Get In My Car"
A combo I didn't know I'd love is Hi-Tek (who probably should have been on the producer list, but I haven't heard from him in a while) and 50 Cent. The Masacre has a couple great songs from these two. This is my favourite. It's got the right vibe to it and, again, I love the hook for this song! The video isn't the best. But you have to appreciate that 50 actually makes videos for most of his songs. Be the judge by watching it HERE. 50 naming names again! Although this time it sounds more like someone who feels left out from being able to be lovey- dovey with someone. Although, there is a late in the game actual jab at Lil Wayne so... Either way, we are working with a great menacing beat from Havoc and, you guessed it, a great hook! See what I mean about having the sample be the main event of a 50 beat? I feel like it gives 50 a great chance to show that he can flow with the best of them in addition to creating amazing hooks you want to sing along with! #6- "Many Men (Wish Death)"
I don't think 50 is known for his story telling but this song proves that he knows how to do that too! In addition to showing another weapon in 50's arsenal it's a beat that features strings and a haunting piano loop that creates a great atmosphere. Check out the music video that doubles as a short film HERE. I dig the soulful sample, of course, but its the insight into 50s psyche that I truly appreciate on this song. Listening to him actually get into how he feels about the state of G-Unit was very interesting coming from an artist who usually has a wall up to his fans and others. The truth is, I'm a big fan of Em's verse on this song. But I really do feel like 50 holds his own on this song. The chemistry 50 Cent and Eminem showed on this track has yet to be outdone or even matched! That has to count for something. Two greats going back and forth and creating a high that has not been outdone 14 years later. This might be my favourite beat that 50 Cent has ever rapped over. This song is an instance of 50 reaching back to his hungry mixtape days, content wise, while feeling polished and more mature thanks to his new label situation. It's a great moment and a slept on song. I don't suggest you watch the video HERE, but you can if you want to. I'm not sure how 50 has videos post Wanksta that look like they should be pre... but whatever! Thanks for the content Fif. I can't be mad at that. Talk about an amazing way to start off an album! This has gotta be one of the best instances of starting off an album ever, right? The drums! The strings! The hook! The quotable mention of the S on his chest! It all comes together to be a top tier 50 Cent song that even haters have to acknowledge is very well crafted! #1- "A Baltimore Love Thing"
There has been a lot of talk about 50's hooks. This song is no exception. What does make this song different is the artistic growth 50 shows on this song. Rapping as if he is actually heroine and creating an extended metaphor for abusive relationships... or, you know, still just drug abuse, honestly came out of nowhere for me. I'm aware that others have done this before, but I'd submit that 50's entry into this type of song's canon is one of the best! At any rate, HERE is an underwhelming video for 50s best song.